The French for subsist is the regular ER verb subsister. It is almost identical to the English word. There are many words like this in French. To remember this imagine that you SUBSIST in France painting French flags. The use of the French flag reminds you that the word is similar in French to the English. 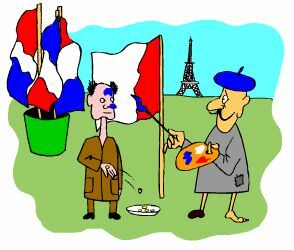 A French cartoon memory trigger will greatly enhance your memorisation and recall process of new French words. The noun is la subsistence. subsist! subsiste ! subsistons ! subsistez ! ⇒Subsister is a regular ER verb conjugated in exactly the same way as thousands of other regular ER verbs. The tribe subsists on hunting: La tribu subsiste grâce à la chasse. ⇒Learn subsister and it will reinforce the pattern for ALL those other ER verbs. ⇒Repeating these tables aloud 10 times during the day, will better embed the patterns into your subconscious, and your long term memory. ⇒Reciting aloud is a great way for you to practise your pronunciation, and helps you to memorize the conjugations. ⇒ They feature French verbs like the French verb subsister. ⇒ You can more easily remember words like the French verb subsister using the techniques of the world's Memory Masters.